Britain has been battered by storms over the last two days. Yesterday saw the kind of wind that pushes you along faster than your feet can keep up with when it’s behind you and stops you in your tracks like an invisible wall when in front of you. It eased off today but picked up again this evening. The sky has been grey, trees fell on train tracks, teenagers on the dark streets shrieked in mock terror, rain flooded parts of the country and umbrellas broke against the wind. This is the kind of weather that you shut the door against and shelter from. 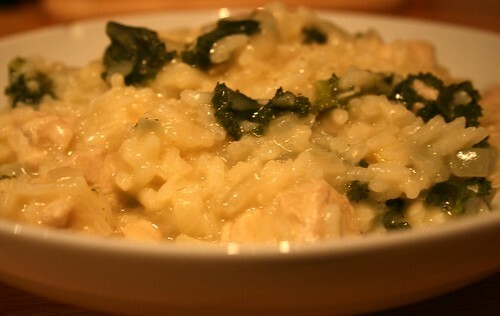 I had one thing on my mind as I travelled home tonight – major comfort food in the form of chicken risotto (with kale, which I decided to add when I saw it sitting in the fridge). This has perfect comfort food ingredients – butter, chicken, rice – and it left me feeling full, sleepy and happy, which is exactly what I expect from comfort food. Put some chicken stock in a saucepan and bring to a simmer. I’d say put on about a litre of stock but you may need less or more, depending on how much rice you’re using. Next, sauté a chopped onion in butter and olive oil until a little softened, then add risotto rice (I used 160grams for 2 people) and stir well to coat the rice with the butter. Add a good slosh of vermouth and again stir well. Chop 2 chicken breasts into bite size pieces and add to the pan. Fry until the chicken turns white, stirring the rice to ensure it doesn’t stick or go dry (if it starts to just add a little stock to the pan). Now add a ladleful of the hot stock to the pan. Stir until the rice absorbs the stock then continue to add the stock a ladleful at a time, stirring all the while. About halfway through add chopped kale and seasoning. Once the rice is al dente and creamy and the chicken is cooked through add no more stock and take the risotto off the heat, then stir in a knob of butter and parmesan cheese. Check the seasoning and serve.